The Fibonacci sequence is a sequence of numbers that can be used as a predictive technical indicator when trying to invest in Forex. This foreign exchange investment strategy provides feedback and information on possible price fluctuations, trends and future behavior that a currency pair may suffer in the future. There are many investors who swear that the Fibonacci method can predict future rates, while others say they are just nice looking numbers that are do not have much use besides to trick Forex newcomers. Because of its popularity and widespread use by market analysis strategists, it is worth to at least know how to interpret the Fibonacci sequence. Significantly, it is not enough to just rely on these numbers to invest in currency exchanges; because any kind of trend or analysis should be used as theorial reference but not as a definitive guide to invest. The Fibonacci sequence is a sequence of numbers that occurs frequently in nature; the discovery is attributed to the thirteenth century mathematician Leonardo Fibonacci. The method involves adding a number to the number immediately preceding it in sequence. When performing the formula and assuming that the first two values are 0 and 1, we can determine the first ten numbers of the sequence: 0, 1, 1, 2, 3, 5, 8, 13, 21, 34. Part of the importance of the Fibonacci sequence for the investor is the value of the percentage that relates each number. The most important is 61.8%; is known as the “golden ratio” and is accepted as the most important. The golden ratio is obtained by dividing any number in the sequence between the number that follows. No matter what, the answer will result in the dividend of 0.618 or 61.8%. 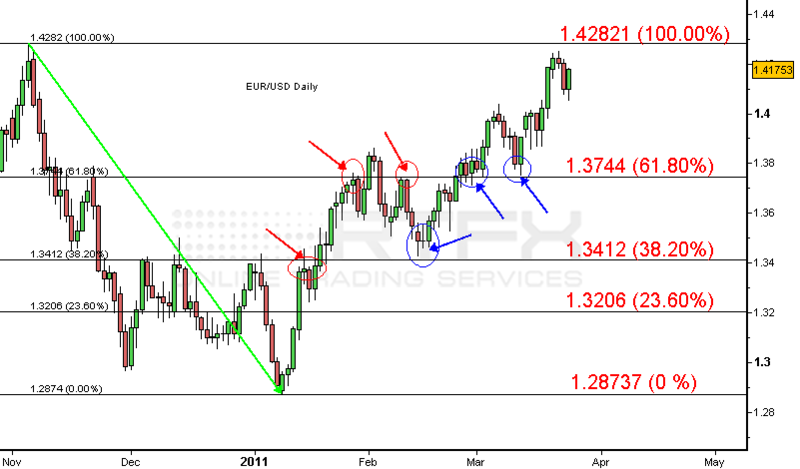 The other two relations used by Fibonacci Forex traders are 38.2% and 23.6%. The first value is obtained by dividing one number by another number which occupies two places after the first one. 23.6% is obtained by dividing a number by the number after the first three places. Now, if horizontal lines corresponding to the Fibonacci relationships are placed in a Forex price chart, often the tips of the peaks and valleys of how the price function changes in the graph, correspond to the values of the horizontal lines. The next step is to decide how to develop an investment strategy consistent with the presentation of the graph. To do this, the trader must identify the oscillations of highs and lows (Swing High and Swing Lows). The high oscillations are identified by a pattern of “head and shoulders” with a peak followed by a larger peak, and then a third peak of similar height to the first. A swing low is identical to a high oscillation but it is inverted upside-down. One way to apply the Fibonacci sequence to identify the values of oscillation and then set specific loss limits and expected profits by applying the chosen investment plan. There is a large amount of information available on the implementation of the Fibonacci sequence in Forex, it is only needed to determine the type of currency exchange where the trader would want to apply the strategy. thanks for all the information you have peroidvd me. It was enormous, I have created a LLC in california . Do I need to have my phone listed with 411 before starting my bus credit or can I use my cell as my business line? Wow! Great to find a post kninokcg my socks off!